Well, the latest batch of EU interim growth forecasts are out, and there are few surprises after so much prior comment. The Euro Area as a whole is expected to contract, but of course within the aggregate contraction some will fare rather better than others. “The EU is set to experience stagnating GDP this year, and the euro area will undergo a mild recession”, according to the press release. What this means in practice is that Greece is expected to contract by 4.3%, while the German economy is forecast to grow by 0.6%. 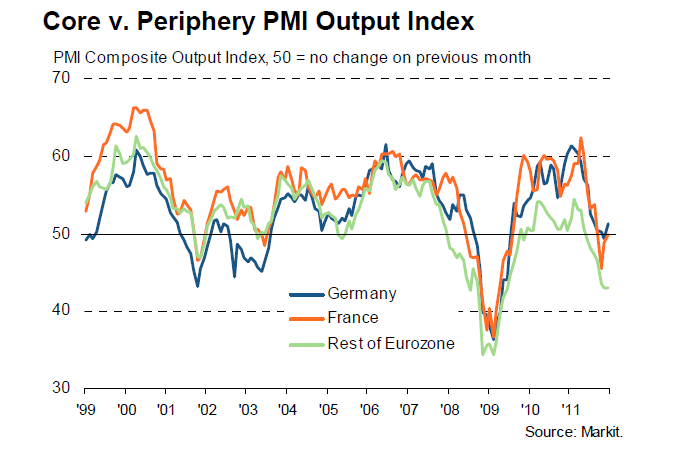 During yet another year Eurozone economies are expected to diverge far more than they will converge. Downward revisions of one percentage point or more were made to the forecasts for Estonia, Spain, Greece, Italy, and the Netherlands, while those for Germany, France, Austria, Slovakia, Denmark, Poland and the UK were either left unchanged or reduced by less than a quarter percentage point. No one was revised upwards. Aside from Greece, the number which has probably raised most eyebrows is the downward revision of the Estonian outlook, by two full percentage points, from 3.2% to 1.2%. In fact the Estonian economy started to contract in the last three months of last year, but now the EU have also let the big secret is out of the bag – Estonia’s “miracle growth” wasn’t only being driven by strong fiscal austerity, it was also being strongly boosted by the activities of just one company, Swedish mobile phone giant Ericsson, who took the decision to locate an assembly plant there. According to reports in the local press the company increased its output sixfold between 2010 and 2011. “The contraction, however, was mostly limited to the export-oriented electronics sector, which had been one of the main growth drivers in the initial phase of the recovery. More recently, manufacturing production seems to have stabilised at somewhat below its recent peak level”. This point has long been obvious to those following the Baltic economies closely, but with such an intense debate going on about whether or not the various countries should have devalued, and with so many people claiming Estonia as a shining example of austerity, drawing attention to such a “mere technical detail” might have seemed like sour grapes, and an attempt to spoil the party. In any event, the Baltics are now drifting back towards recession – mild or otherwise – but that will be another story for another day. Whatever the shocks are which are causing this downturn (assuming you like models of cycles and shocks) they are not hitting all countries anywhere near equally, which is just a nother way of saying that the Euro Area as a whole is vulnerable to the impact of asymmetric shocks, which naturally makes the handling of monetary policy much more difficult than it otherwise would be. Naturally it is obvious that sovereign debt pressures vary widely, as does the impact of the credit crunch (try this one – German companies enjoy access to credit – from the FT last week, if you were in any doubt), and the level of unemployment is hardly uniform. On the other hand, we could consider another possibility, and that is simply that following the Global Financial Crisis (as I argued in this post back in 2010) upturns may be weaker and shorter than in the pre-crisis years, while downturns may be more marked and more frequent. Put another way, the growth path of the Euro Area economy over the next decade may look more like that of Italy or Portugal during the first ten years of this century than it will look like that of Spain or Ireland during the “good years”. Japan is always out there glancing towards us, just as a reminder of what having two lost decades actually looks like. In addition Europe has ageing population problems, and a large economic re-orientation to carry out from looking towards growth in internal demand to looking towards sales in Emerging Markets, so it would be unrealistic to be thinking in terms of stellar growth anyway. More structural reforms will certainly help, but they are hardly going to be a game changer. Moving beyond these issues, and thinking about how in fact the short term outlook in the Euro Area is better than it looked like it was going to be last November, we might want to ask ourselves whether the second half of 2012 might not surprise a little on the downside, while 2013 may remain much more of a flatliner than people are expecting. Barring “accidents” we are unlikely to see a crash, but rather a steady process of fiscal consolidation and debt deleveraging, which will surely mean growth will remain weak and constantly tending towards zero. This kind of view is basically confirmed as far as I can see by the latest set of flash PMI results, which confirm the general impression that the key countries in the global economy are moving from stabilisation (not sinking further into recession) towards stagnation (slight growth but without signs of a significant recovery in activity in the vein of the “good old days”). 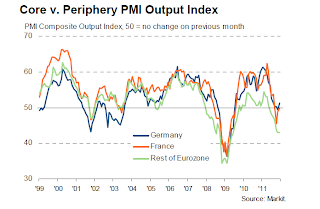 The Euro Area is still marked by the division between the core (where the activity decline has been halted, and there are even signs of modest growth) and the periphery (which is still mired in recession). Main downside risks in the coming months are the slowdown in the Chinese economy and lack of progress in the US recovery, plus some level of “event risk” on Europe’s periphery. Both domestic and export orders for manufacturing industry are still falling in China, and once we get past the New-Year-holiday statistical-blip I fully expect data to be weaker than most are anticipating as the housing boom continues to unwind. 8% growth for the Chinese economy this year seems to be way too optimistic. I think some people imagine that emerging economies can grow at double digit rates forever simply because they have a large population, conveniently forgetting that Japan was once expanding in this way. Europe’s economies are in the throes of a large structural transition, one which will lead them to look well beyond the fronties of the EU to get the demand traction the regions economies so badly need. 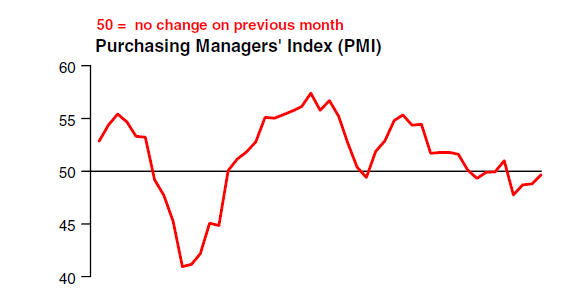 This month’s comment from Chris Williamson, Chief Economist at Markit, is pretty much to the point. â€œA retreat back below the 50.0 no-change level for the Eurozone PMI is a disappointment, and highlights the ongoing risk that the region may be sliding back into recession. Although business conditions are showing signs of stabilising so far this year, which represents a marked improvement on the widespread deepening gloom seen late last year, the Eurozone is by no means out of the woods. Demand needs to improve considerably in coming months before we can safely say that the region will return to anything like reasonable growth”. The key, as ever for Europe, is going to be with the German economy, which I suspect may feel the China slowdown more acutely than is being projected. China problems, remember, come on top of existing ones in the traditional European markets, so if I am right it will be some sort of “double whammy”. 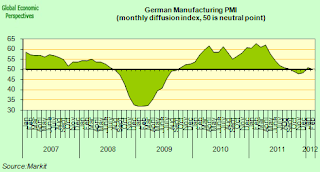 â€œGerman output seems to be gradually grinding up through the gears during the first quarter of 2012, with overall growth in February the second-strongest since the middle of last year. 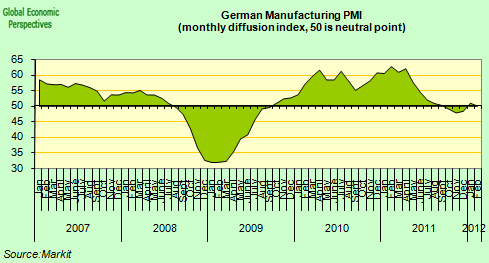 The latest survey therefore suggests that weâ€™re on track to see a modest rebound in German GDP following the slight contraction during Q4 2011″. â€œHowever, manufacturers are still suffering from shrinking underlying demand and in turn relying on backlogs of work to boost production. The failure of new orders to gain traction mainly stems from weak external demand, as exports have now fallen for eight months in a row”. So basically the German economy is still running on some sort of borrowed time, as orders accumulated over the really good months are steadily worked down. 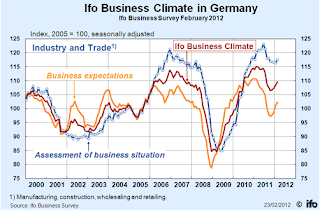 Nonethless, as today’s much watched IFO survey suggests, the German business community remains optimistic, and even the expectations component continues to sneak upwards. Thus the road ahead looks clear, if somewhat flat. 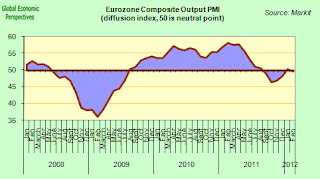 The Euro Area’s two largest economies look set to escape “the worst of the worst”, but remain dependent on factors outside their control, in the US, in China, and in the Emerging Market world as a whole, all of whom could in their turn be badly affected by the impact on risk sentiment of any unfortunate “accident” in the Eurozone itself. Most of these issues are unlikely to go away any time in the foreseeable future, which is why I think 2012 will be marked as the year we learnt to live with the world we have, and stop dreaming about another one, which has long since ceased to exist. Will 2013 be better than 2012? The honest answer, depsite the pile of analyst reports, is “who knows”, which is why, whether we like danger or not, we are condemned to have to grow accustomed to it. This entry was posted in A Fistful Of Euros, Economics, Economics: Currencies, The European Union by Edward Hugh. Bookmark the permalink. The alternative view: the most reliable economic cycle is the US presidential election cycle. I have a feeling 2012 is going to be just fine. 2013 may have to fend for itself though. The Estonian figures are just one more illustration of the dubious value of aggregate statistics in economics, especially when they are used to make macroeconomic inferences about the overall state of an economy. In statistical parlance the distributions of almost all important economic variables (the size of firms, wealth of individuals, changes in stock prices) have been observed to be very heavy tailed: in particular they lack a mean. This means that an aggregate variable formed by simply summing the individual values in a sample does not tend to a macroeconomic value that reflects some overall state of its microeconomic components. Instead in heavy tailed distributions the aggregate is dominated by the largest individual value within it, so says little or nothing about the sample as a whole. This phenomenon is most noticeable in small economies where a single firm or sector dominates economic activity, as evidenced here in Estonia, but it applies to economic activity everywhere. Unfortunately, most people’s knowledge or experience of statistics is shaped by distributions with well defined means, e.g. the familiar bell-shaped normal distribution. In samples from such distributions the aggregate is determined by the mean of the whole population and will grow with sample size to dominate any individual value. Consequently commentators, economists and politicians tend to read too much into figures such as aggregate industrial output; they see these as indicators of the overall health of a sector or economy rather than just indicators of the health of the few largest actors. There is a real need for more sophisticated statistics that truly indicate the situation of the 99%, not just the 1%. Very good blog, Edward, and about right in lenght. Your blogs at Economonitor are too long, and as a slow reader I almost never get through them. As a non-university economist your approach is by definition unconventional (or they are the conventionists, depending on how you wish to put it), but you could learn a bit from these scholars. You see, as educators they are always keenly aware how their words come across; the whole idea of teaching is that the words sticks with the audience. Therefore one rarely sees lenghly and boring analysis from them, be it in teaching or in blogs. But this blog of yours is good, because it is short and snappy, and because the content is cutting edge, everything is set for it to reach a maximum of readers. I am sorry, but is is just impossible to euro-area as a whole to net export. Whole idea of turning eurozone economies to German style export powerhouses is based on fantazy. Eurozone as a whole is incapable of generating any meaningful current account surpluses. Well frankly this is not the sort of stuff I normally read, and I doubt I will be reading much of it again in the future. I don’t think he understands what the problem is, and just wants to have a go at Krugman. Which is fine, but it isn’t the kind of thing that interests me. One of the problems of all this is that the debate ceases to be economic and becomes ideological. Japan’s ageing population problem is unsustainable. One day they will lose the CA deficit and will have difficulty funding their debt. At which point a new age will be born. Incidentally, for what it’s worth I’ve been trying to convince Krugman for more than a decade now that Japan’s problem is fundamentally demographic. But I haven’t gotten anywhere. I think he still believes they are in a standard liquidity trap, and that simply by setting an inflation target and printing enough money they can get back to “normal”. “The alternative view: the most reliable economic cycle is the US presidential election cycle. I have a feeling 2012 is going to be just fine. 2013 may have to fend for itself though”. Well, you do offer the simplest and most straightforward explanation for why the US hasn’t drifted off into the recession it seemed it was heading for – namely that the adminstration is doing a Spain/Greece and having more deficit than they are admitting to. In an election year that would make sense. There is no proof, only circumstantial evidence. “The Estonian figures are just one more illustration of the dubious value of aggregate statistics in economics, especially when they are used to make macroeconomic inferences about the overall state of an economy”. Well, that’s a very big generalisation from one small data point. As I suggest in the post, it was quite obvious without using any sophistocated statistical techniques what was going on, but I refrained from using the argument because I felt it was an easy way to win a debate, and I was more interested in the substance of the debate rather than the details – ie whether or not Estonia should have devalued, and yes, I was making very general macroeconomic inferences. That is normal: I am a macroeconomist, and only really work with aggregates. “I am sorry, but is is just impossible to euro-area as a whole to net export”. Well then, to go back to Krugman, we are all doomed, since there really is no other way of handling all this debt without a massive financial crash. Do you have a vegetable garden nearby? â€œI am sorry, but is is just impossible to euro-area as a whole to net exportâ€. As a long as there are other regions available for the eurozone to trade with or to invest in, a trade surplus and a current account surplus are possible. The only economic unit that cannot achieve this, is the world as a whole, unless we could have trade with other planets. I have no argument with your analysis of the situation, nor the importance of the issue. Indeed this is my concern: when the choice of the right macroeconomic policy is both really important and really hard, and when ideologues are increasingly willing to dispense with any critical review of evidence as long as it supports their position, then we really need reliable macroeconomic statistics on which to base policy. Since the distributions of most economic activities are heavy tailed, simple aggregates just aren’t that reliable as highlighted by your review of the Estonian figures. Unfortunately those with axes to grind are often quite happy to use use dodgy data to grind them. I’m agree on the flat growth in core euro zone for 2012 and following years (at least a business cycle of 4/5 years I think). But for peripherical countries (yes like Greece) I think that core EZ countries can discover again their own emerging countries. Let pass the financial storm and see that debt market is so full of bad expectations that it is impossible to lend to someone poorer than you (I’m thinking to Greece, Portugal, Ireland and other small euro countries, even east european countries because exchange risk will certainly be in the good direction of investment). Then think about real economy and see investment opportunities in these countries. You gain on transportation what you loose on labor price (with raising expectations on oil prices), and these countries are close from your HQ. Developing production capabilities and their domestic market ma be a good strategy for core EZ countries seeking growth, in particular in services. What mr. Eamonn Fingleton is saying is that Japan has a population problem, but the basket case Japan is as you said where debate ceases to be economic and becomes ideological. The economic performance of Japan on the last 20-30 years is much better than commonly assumed.